The Economist – IN MAY 2014 DOZENS of mourners attended the funeral of a healer in the Kailahun District of eastern Sierra Leone. She had died after tending to people struck by fever, vomiting and bloody diarrhoea. As women ritually washed her corpse, 14 of them contracted the virus that had killed her and many who had sought her remedies. After the Ebola virus had swept through west Africa in the worst epidemic of the 21st century so far, as many as 365 deaths were traced to that single burial. In all, the outbreak killed 11,310 people. When Bailor Barrie, a Sierra Leonean doctor, heard about the first cases of Ebola in his country, he knew it would spread quickly and widely. “Sierra Leone is a health desert,” he says. “No surveillance; no public health; no health system.” Life expectancy was already just 50 years, and an eighth of children died before their fifth birthday. Most clinics offered no prospect of affordable, accurate diagnosis and effective treatment, so few people trusted them when they became ill. Before the outbreak the country had just one doctor for every 50,000 people. (America has one for about every 400; China one for 275.) Then 7% of Sierra Leone’s health workers died from Ebola during the epidemic. That epidemic was an avoidable tragedy. A slow international response, especially by the World Health Organisation (WHO, the UN’s Geneva-based public-health body), and inadequate domestic health systems proved a lethal mix. Probably more people died as an indirect result of the outbreak than from the virus itself. The number of children treated for malaria in Sierra Leone in September 2014 was 39% down on four months earlier because health workers were overwhelmed. Writing in April 2015, Bill Gates, whose family foundation spends more on health aid than most rich countries do, expressed the hope that Ebola would serve as a wake-up call for public health. Since then the World Bank has launched a facility that will help meet the cost of responding to a future pandemic. Tedros Adhanom Ghebreyesus, the Ethiopian who took over as boss of the WHO in July, receives daily briefings on disease outbreaks. That did not happen under his immediate predecessor, Dr Margaret Chan, who occupied the post for ten years. But Ebola has also encouraged a broader rethink of the approach to global health, shifting the emphasis from trying to eradicate single diseases to building health systems that are resilient to diverse threats and less reliant on aid. One of its aims is to reduce the number of people pushed into poverty by having to pay for health care. Central to this effort is the embrace of universal health care, the idea that everyone should be able to get the care they need without facing financial ruin. All countries have committed themselves to getting there by 2030 as part of the UN’s “sustainable development goals”, a voluminous set of targets agreed on in 2015. That commitment marks a new chapter in global health. Even though recent years have seen remarkable improvements—child deaths, for example, fell from 10m in 2000 to 6m in 2015—much remains to be done. A report published in December by the World Bank and the WHO found that at least half the world’s population does not have access to what it called “essential” health services, such as antenatal care, basic treatment for malaria, HIV and tuberculosis, and checks for high blood pressure. Another study, in 2015, for the Lancet, a medical journal, estimated that 5bn people around the world cannot get basic surgery such as a caesarean section, a laparotomy (an incision into the abdominal wall) or a repair for a fractured bone. According to the paper from the World Bank and the WHO, 800m people spend more than 10% of their household budget on health care, and nearly 100m are pushed into extreme poverty (defined as having less than $1.90 a day to live on) every year by out-of-pocket health expenses. This chimes with smaller-scale studies. A survey last year of patients at a government hospital in Uganda discovered that 53% of their households had to borrow money to pay for treatment and 21% sold possessions. About 17% lost their job. It used to be common even for people in rich countries to have to choose between financial or physical health. When Britain’s National Health Service, the world’s first universal-health-care system free at the point of use, was set up in 1948, households received leaflets telling them that the service would “relieve your money worries in time of illness”. 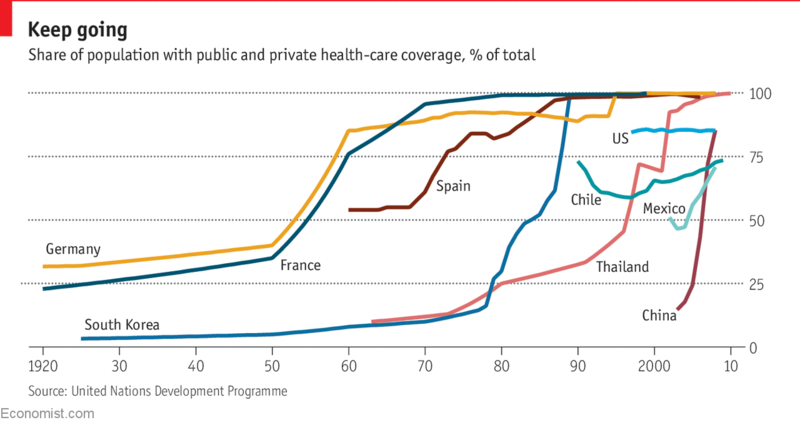 Since then many more countries have followed suit with comprehensive health-insurance schemes (see chart). As countries get richer, they spend more on health. This is known as “the first law of health economics”. As a share of GDP, the developed world spends roughly twice as much on health as developing countries do. But this does not mean that once the world gets richer, universal health care will necessarily follow. Nor are rising incomes the only cause of improving health. Wealth and health are intertwined, but only up to a point. In “The Great Escape”, a book on the historical relationship between health and growth, Angus Deaton, a Nobel laureate in economics, explains that a country’s GDP per person is linked to its life expectancy (see chart). On average, as countries’ GDP per person rises, their people live longer. Higher incomes mean they have more money to buy food and medicines, and governments are better able to afford public-health measures such as sanitation. But life expectancy over time has increased even more than implied by rising incomes. For Mr Deaton this is evidence that income is not the only factor; the application of knowledge also matters. “There are ways of ensuring good health at low incomes, and ways of spending large sums of money to no purpose,” he says. America is a case in point. This special report will argue that universal health care is both desirable and possible, even in low-income countries. Some countries achieved near-universal coverage when they were still relatively poor. 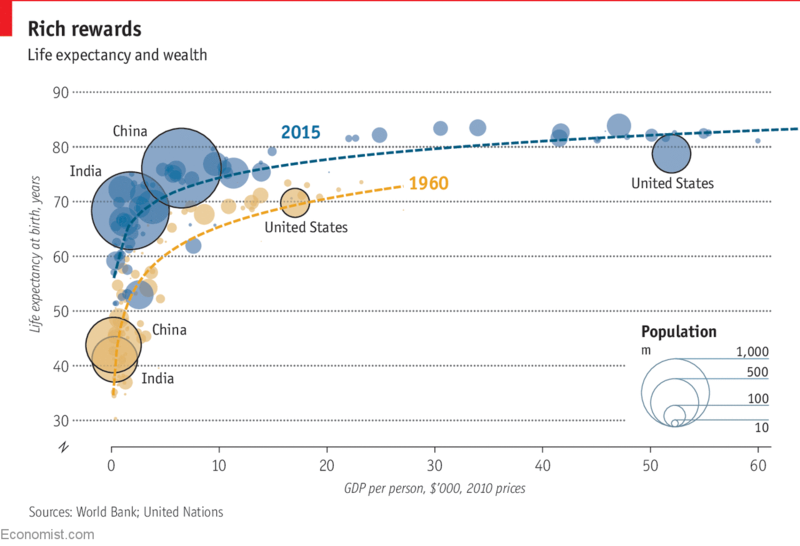 Japan reached 80% when its GDP per person was about $5,500 a year. More recently, several developing countries have shown that low income and comprehensive health care are not mutually exclusive. Thailand, for example, has a universal health-insurance programme and a life expectancy close to that in the OECD club of mostly rich countries. In both Chile and Costa Rica income per person is roughly 25% of that in the United States and health spending per person just 12%, but life expectancy in all three countries is about the same. Rwanda’s GDP per person is only $750, but its health scheme covers more than 90% of its population and infant mortality has halved in a decade. “Ebola would not have happened there,” says Dr Barrie. This may start off a virtuous cycle. It is becoming increasingly clear that better health can lead to higher incomes, as well as the other way around. Economists at the World Bank used to call spending on health a “social overhead”, but now they believe that it speeds up growth, says Timothy Evans, one of its senior directors. A study in 2011 carried out by the University of St Gallen looked at 12 European countries between 1820 and 2010 and found a close link between the expansion of health care, a fall in mortality rates and growth in GDP per person. Another study found that in Britain as much as 30% of the growth in GDP between 1780 and 1979 may have been due to better health and nutrition. A paper by two leading economists, Dean Jamison and Lawrence Summers, found that 11% of the income gains in developing countries between 1970 and 2000 were attributable to lower adult-mortality rates. Smaller-scale studies support these historical analyses. Improving health, for example through malaria-eradication efforts, is associated with children receiving more schooling and going on to earn more money in adulthood. And lower out-of-pocket health costs reduce inefficiencies in purchasing health care and can encourage consumer spending. Clearing land of disease-carrying parasites can open it up to farming, mining and other forms of development. Pioneering countries and new research have added to the argument in favour of universal health care. So, too, has the growing realisation among the biggest institutions in global health that eliminating specific diseases is hard in places where basic health systems are dysfunctional. Indeed, single-disease programmes can make the problem worse by setting up parallel structures or diverting health workers. Mr Gates has recently called for more investment in primary health care, a core part of achieving full coverage, to improve the outcomes of his foundation’s schemes. Making a commitment to universal health care is the easy bit. The hard part, for both governments and international organisations, is to find ways to make the best use of limited resources and then get on with reform. That task is made even tougher by shifts in the burden of disease.